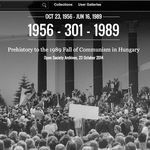 As part of the exhibition series commissioned by the Google Cultural Institute to mark the 25th anniversary of the fall of Communism, OSA has curated an online exhibition entitled 1956 - 301 - 1989. Launched on November 13, the exhibition presents the 1956 Revolution, its suppression and the ensuing reprisals, and how the taboo surrounding the events of 1956 was finally broken from the mid-1980s onwards by the Hungarian democratic opposition. The 301 in the title refers to the unmarked grave plot where the leaders of the 1956 Revolution were buried, having been tried and executed in secret in June 1958. Selected items from OSA's holdings include a sketch of military maneuvers in Budapest in 1956, Radio Free Europe (REF) research publications, Hungarian propaganda films and state surveillance reports, samizdat and opposition activists' videos, publications and posters, a wooden grave marker at Plot 301, 1989-related ephemera collected at OSA as part of the Europeana 1989 project, a June 16, 1989 RFE Situation Report detailing the public reburial of Imre Nagy and colleagues, and photographs from the Fortepan photo archive. The exhibition closes with materials from OSA's 2008 reconstruction, "The Trial," on the 50th anniversary of the execution of Imre Nagy and colleagues.